The ingredient Nirnroot comes from the "Nirnroot Plant", which can be found growing outside near water and indoors as a potted plant. It is a very noticeable, vibrant, greenish-blue plant with four large leaves that emits a quiet ringing noise. 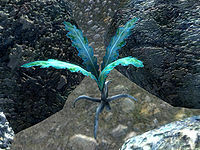 There are hundreds of locations where the plant can be found, but unlike every other plant in the game it does not regrow; each plant can only be harvested once. As a result, it is considered to be a rare plant. It cannot be duplicated in the Arch Mage's Enchanted Chest, or by scroll duplication or arrow duplication. It can, however, be duplicated using the Skull of Corruption. The first time you harvest a Nirnroot plant, a new quest, Seeking Your Roots, will be added. To completely finish the quest you will have to collect 100 Nirnroot samples, though it's divided into smaller quests where you have to collect 10, 20, 30, and 40 roots, respectively. Nirnroot's alchemy effects are all unique among Oblivion ingredients, and therefore cannot, in general, be used to create any poisons. Only a master alchemist can create a poison using Nirnroot, the result being a Drain Health poison. If the Shivering Isles expansion pack is installed, a new ingredient, Unrefined Greenmote, is added that also has Drain Health and Drain Fatigue effects, allowing poisons with those two effects to be created. Normally there are no guaranteed samples of Nirnroot. The Deepscorn Hollow official plug-in, however, adds a single sample of Nirnroot sitting on a desk in the bedroom area of Deepscorn Bastion. Because this Nirnroot is, for some reason, designated as a food, this sample will respawn every three days. This is the only instance of Nirnroot in the game that respawns. 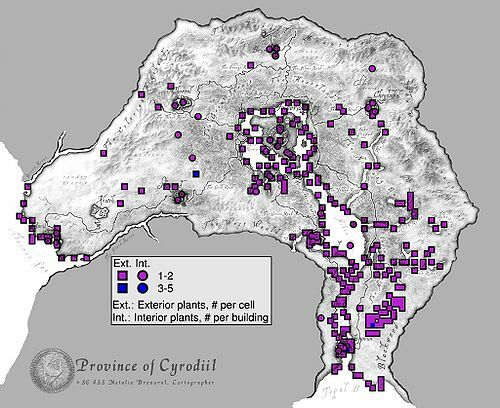 In total, there are 306 Nirnroot plants in the game, with 263 found outside and 43 inside. One more can be found in the Wizard's Tower official plug-in, another in Battlehorn Castle and one respawning sample in Deepscorn Hollow, for a total of 309 when using official plug-ins. The map to the right provides an overview of where each of the outdoor Nirnroot plants can be found. The Oblivion map shows the exact locations of every plant in the game; zooming in to maximum will show all the plants in that area. A large image with all the outdoor Nirnroots can be found here. The vast majority of plants are on the banks and tributaries of the Niben, with smaller, although not less dense concentrations on the coast west of Anvil, the coast south of Leyawiin, and the 'rainforest' east of Leyawiin. Less than a quarter of the plants can be found elsewhere. There are also 16 Nirnroot plants that are smaller than usual, although not enough to be remarkable. These are small plants that grow in flowerpots inside houses and buildings. Note that you can freely "steal" indoor Nirnroot without any repercussions, even if someone is watching you. Frostcrag Spire: Alchemy garden in the corner between the base of the "mossy rock" and the floor of the left garden (facing from the bedroom). Battlehorn Castle: Behind the stuffed Wolf in the trophy room. Deepscorn Hollow: A respawning Nirnroot sample on the desk in the bedroom (once you have purchased all upgrades). The word "Nirnroot" refers to Nirn, the planet on which the Elder Scrolls is set. When searching for Nirnroots, it may be helpful to go into Options, then Audio, and turn the Master volume and the Effects volume all the way up and turn everything else down (voice volume doesn't really matter). This makes the distinctive chiming sound created by the Nirnroot much easier to detect and locate. The reason Nirnroot doesn't regrow is because Nirnroot plants have a script that disables them. On the PC, you can use the console command to re-enable them by clicking on it in the console before harvesting it, then harvest it, and finally typing enable into the console, it should reappear. Also, you can simplify this by using the construction set to remove the script from the plant. Esta página foi modificada pela última vez à(s) 01h29min de 31 de maio de 2015.